Supplemental Figure S2. Immunodetection of heteromannans in enzymatic deconstructed sections of Arabidopsis and Lepidium seeds and in untreated section of tomato seeds. A, and B, LM21 heteromannan (HM) is not detectable in Arabidopsis enzyme deconstructed (ED) 3 h-imbibed seed sections but is weakly detectable in embryo cell walls of 3 h-imbibed Lepidium seeds (D, inset image). B, LM21 HM is detectable in the mucilage of intact Arabidopsis seeds (inset image). C and D, LM21 heteromannan is abundant and the mucilage (M) and at the testa surface (T) of Lepidium seeds. 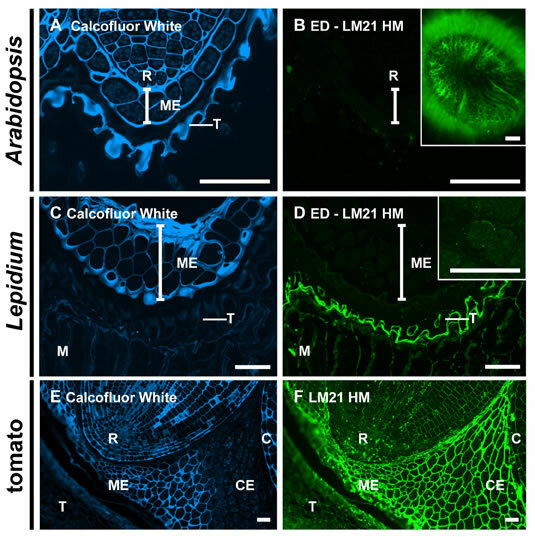 E, Calcofluor White labelling of 3 h-imbibed tomato seed sections revealed tissue level asymmetry deliniating micropylar (ME) and chalazal endosperm (CE) regions of the endosperm. F, LM21 labelling indicated abundant heteromannan in endosperm and embryo cell walls. Vertical bars indicate extent of ME in Arabidopsis and Lepidium sections. (R) = radicle apex, (C) = cotyledons. Scale bars = 50 μm.